Loads of dinosaur fun for focussing on what children can do! 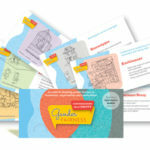 Can-Do Dinosaurs is designed to help adults introduce children to the critical skills needed for safety, self-reflection, resilience and interrelationships. Featuring a herd of 28 dinosaurs direct from the Jurassic era, this resources carries a timeless and invaluable message for children—that they can learn and grow by focusing on what they can do, rather than on what they can’t. Notice what your students or children do well. Acknowledge them with the appropriate card. 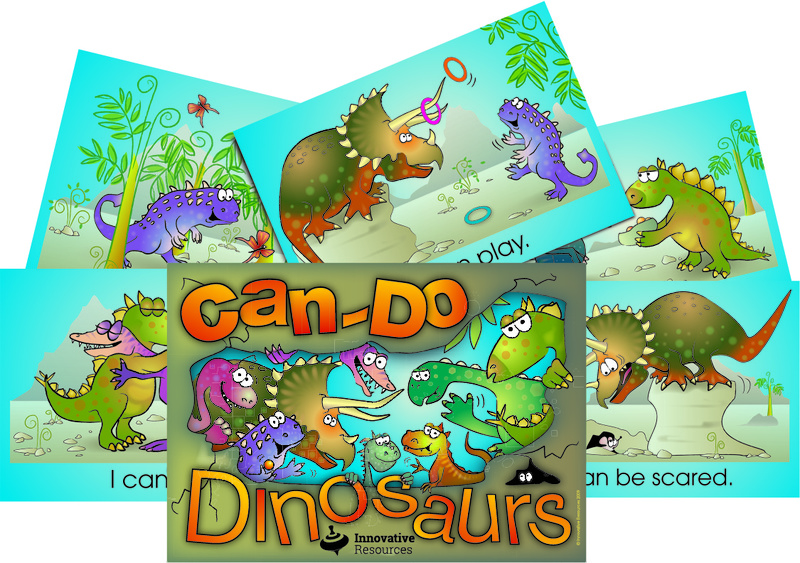 Can-Do Dinosaurs is an essential resource for early childhood workers, preschool teachers, primary teachers, social workers, and family and child protection workers. Parents will also love to introduce their kids to these quirky dinosaur characters to encourage good manners, positive habits and healthy self-esteem! Sometimes we only think of skills in terms of practical achievements, like playing a sport, learning a musical instrument, or the challenge of tying a shoelace. Of course, there’s no doubting the delight young people experience when they get the knack of these things. But Can-Do Dinosaurs is about skills of far greater—and less obvious—importance. These cards represent the life skills we all need to learn: the very ones that knit our relationships together, empower us, and keep us safe. Can-Do Dinosaurs is a skill-teacher dressed up in Jurassic garb, ready to help children harness the strength and resilience that resides within. Bright & District Kindergarten Newsletter, 2011. In March 2013, Innovative Resources received a message from Nicole Rotaru, an aid worker and educator about to begin a two year contract in the Nuba Mountains of Sudan. She was leaving to join a group working in the region. The mountains, which cover some 48,000 square kilometres, lie at the geographical heart of Sudan, and have been the site of a two-decade long conflict over religion, resources and ethnicity. Before she left, Innovative Resources donated several card sets for Nicole to take with her. There was no guarantee the cards would reach their destination—in the warzone roads are few, cars and trucks unreliable, and transport of food and other essential items takes priority. But in May, Nicole and the cards made it safely to their destination, and she generously sent news and photos showing the cards in the hands of children and patients at a local field hospital. ‘The laughter generated was a marvellous tonic! “I can…, I can…,” indeed! The Nuba people have great courage, determination and resilience. They have lived through oppression, hunger and war for most of their lives.’When we made contact with Nicole in October 2013 it was a welcome, peaceful day in mountains. Life, for the time being, was quiet for these children who have little experience of peacetime. I was working with a family that two children (aged 9 and 11) who had been court appointed to live with their Dad. Dad had a new wife and two smaller children. He had not seen the children for six years. I used the I Can Monsters cards [republished as Can-Do Dinosaurs] to start some positive discussion and to have each person see what the others saw they brought to the family unit. Sitting round the table, we took turns to hold the Monsters cards and chose one for each person present. For example, the boy chose a card for himself, then one for his sister, his Dad, step-mum, and step sisters. I asked him to give an example of why he chose that card for them. I took a photo of each family member and used the I Can Monsters stickers [Can-Do Dinosaur stickers available] to make a reminder of what was chosen for them and by whom, so that each of them had a reminder of the things the others had chosen for them. This helped the family see that each member was contributing to the family unit, and that the small things they did were appreciated by the others.